New research reveals that Jupiter-like planets quickly move to orbits close around their baby stars, helping astronomers better understand how planetary systems like our own solar system form and evolve into maturity. The discovery was observed through the Canada-France-Hawaii Telescope (CFHT) on Mauna Kea, a dormant volcano on the island of Hawaii. Looking at newly-born stars in the Taurus stellar nursery about 450 light-years away from us, the team showed that the latest baby star they scrutinized, nicknamed V830 Tau, exhibits signatures that closely resemble those caused by a 1.4 Jupiter mass planet orbiting 15 times closer to its host star than the Earth does to the Sun. 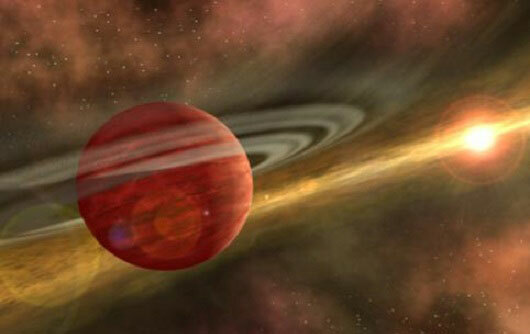 Be the first to comment on "Hot Jupiters Orbit 20 Times Closer to Their Host Stars Than Earth Does to the Sun"